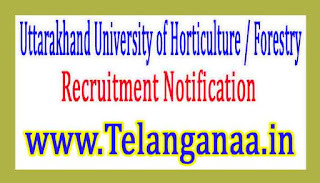 Uttarakhand University of Horticulture & Forestry invites application for the post of 04 Programme Coordinator, Technical Assistant & Various Vacancies. Apply Before 12 January 2017. For Programme Coordinator - Doctoral degree in relevant subject including relevant basic sciences with 8 years experience in the relevant subject as Scientist/ Lecturer/ Extension Specialist. For Subject Matter Specialist : Master’s degree in Animal Husbandry & Vet. Sc. or equivalent qualifications from a recognized University. Selection Process - Selection will be based on presentation/ written test/ interview. Application Fees - Candidates belonging to General/ ST/SC have to pay Rs.1000/- & Rs.500/- through Demand Draft Draw in favour of Comptroller, Uttarakhand University of Horticulture & Forestry payable at Punjab National Bank, Branch Pauri (Branch Code no 1370). How to Apply UGB Vacancy - Interested candidates may apply in prescribed application form along with self-attested copy of relevant documents, experience Certificate Send to the Project Office,Research & Extension Center of VCSG Uttarakhand University of Horticulture and Forestry, Nigam Road, Haripur, Selaqui, Dehradun–248011, Uttarakhand on or before 12.01.2017.